Choosing your next smartphone might be a no-brainer if you’re a die-hard Samsung or Apple fan. But if you’ve been growing weary of constantly running out of iCloud storage for your iPhone or waiting so long to get the latest update for your Android phone, you might consider switching your operating system allegiance. Since 99.6 percent of smartphones in the U.S. run on iOS or Android, we’ll focus on these two major operating systems. We’ll eschew hardware features such as cameras, which vary wildly. Instead, we’ll look at the software features that define each OS to help you decide which camp you should pick for your next smartphone. We live in a golden era of smartphones when most major glitches have been ironed out, bar the odd exploding phone. Both iOS and Android have emerged as smooth, fast, intuitive operating systems. So, when it comes to ease of use, choosing an OS is about looking for that extra boost of convenience. Swiping right on the Android home screen displays a Google-powered feed of links and updates based on your interests. That feed is based on your Gmail and Chrome history plus Google searches, and like all things Google, it’s a scarily good predictor of what you will indeed find clickable. Apple has a similar swipe right feature that you can configure with widgets to show content from apps so you can easily see the weather, news, commute time and upcoming appointments. However, this widget approach is not nearly as slick as the feed you'll find on Android phones. Verdict: For convenience, Android’s predictive feed of links, recipes, weather and traffic updates is unbeatable. Watch out: If the thought of your search and browsing history being cobbled together gives you the privacy heebie-jeebies, you might prefer to turn off the feed on your Android phone (or never sign in to Chrome on desktop or mobile). Apple’s iOS is indubitably incredibly easy to use. Download an app, and it appears on the home screen. That’s where it lives. You can drag it to another screen or, in a relatively recent evolution, you can put it into a folder for organization’s sake. But as smartphones burst with ever larger numbers of apps, Android’s computer-like feature way of hiding away the bulk of apps you don’t use regularly under the alphabetically organized All Apps view becomes increasingly useful. You’ll find scores of Android apps that let you customize the way your phone looks — different icons, wallpapers, the color of notification LEDs — along with folder features and far more live-updating home screen widgets than iOS offers. Or you could make the minimalist choice to not have any home screen icons at all. Verdict: Android has always been the clear winner for anyone who wants to customize their phone. Watch out: The Android toolbar can get very crowded, since apps by default are allowed to send you push notifications, from unrequested traffic updates to random app alerts. If you want a tidy toolbar, dig into Settings > Notifications and start customizing. The days when iOS apps outstripped Android apps in quality and breadth are long gone, but that doesn’t mean it’s a totally equal playing field. While the vast majority of apps and games are available for both iOS and Android devices (albeit sometimes launching a little later for Android), Apple’s strict vetting of app submissions means that malware-packing or badly written apps remain more common on Android. 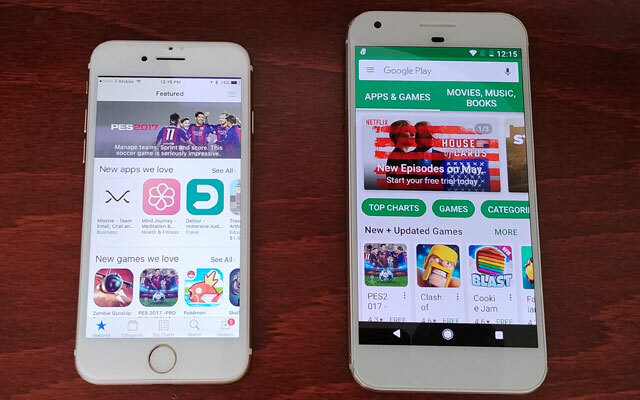 Verdict: Apple’s App Store slightly edges Google Play in terms of quality control, but a little research can easily prevent you from falling prey to bad downloads. Watch out: One of the biggest obstacles to switching OSes is that you could potentially lose years’ worth of apps painstakingly downloaded and paid for. Remember when asking a just-launched Apple Siri where to hide a dead body was all the rage? Nearly 40 percent of users in the U.K., U.S. and China now use Siri or Google’s Assistant at least once a day. Experts expect that within three years, we’ll be using voice assistants for a fifth of smartphone features, beyond setting alarms and online searches. 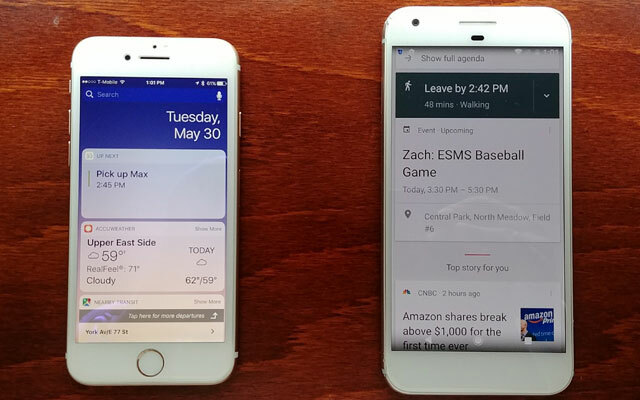 Both voice assistants can parse conversational questions and respond with direct information plus perform phone-based tasks such as making calls and launching navigation. The real battle for supremacy is being fought off the smartphone. Google’s Assistant powers its Home speaker, which can control smart home gadgets to play music, turn off lights and answer questions, while Apple’s version is yet to launch, though Siri on your phone can control lights and other smart gadgets. Verdict: For those who want a smart home assistant now, Android takes the win. 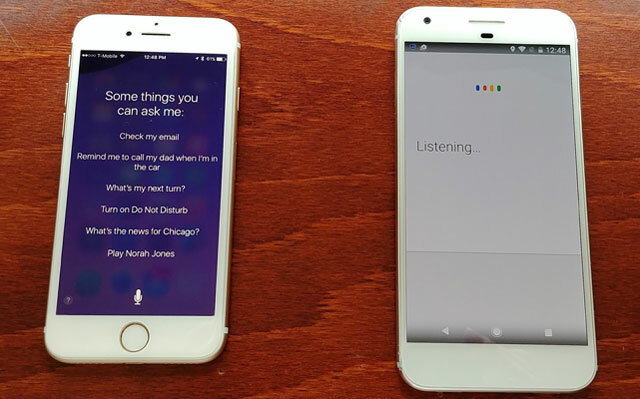 Otherwise, both iOS and Android have an increasingly intelligent voice assistant to manage their phones. Watch out: Always-on voice assistants that can respond to wake-up commands have been the subject of privacy concerns. With smartphones as the repository for our favorite photos and message threads, backing them up to a reliable cloud storage service is crucial. Apple offers a measly 5GB of free iCloud storage to be shared between all iDevices for your photos, documents, and other files, with no option to selectively sync, only to manually delete. Google Drive provides 15GB for free, with unlimited 16MP photo uploads for Android users and full-resolution uploads for Google Pixel phones. Of course, Apple’s $0.99-per-month cost for a more reasonable 50GB of storage doesn’t exactly break the bank, but Google Drive offers more than backup features. Users can also collaborate in real time on Google Doc files and use selective sync to back up necessary files. Verdict: Android wins by a mile with 15GB of Google Drive storage that includes unlimited full-resolution photo uploads if you have a Google Pixel phone or up to 16MP for other phones, plus collaborative features and selective sync. Watch out: Make sure your photos are physically backed up — say, on a desktop system or hard drive — before switching cloud services, especially if you’re moving from iOS to Android. Any content synced from a defunct iPhone is deleted within 30 days. If you’re thinking about getting a smartwatch, it’s crucial that you own a phone that will work with it. Choose from two Apple Watches or dozens of Android Wear-powered watches from several manufacturers, including the Asus ZenWatch 3 and high-spec flagship watches like the Samsung Gear 3 and the LG Watch Sport. 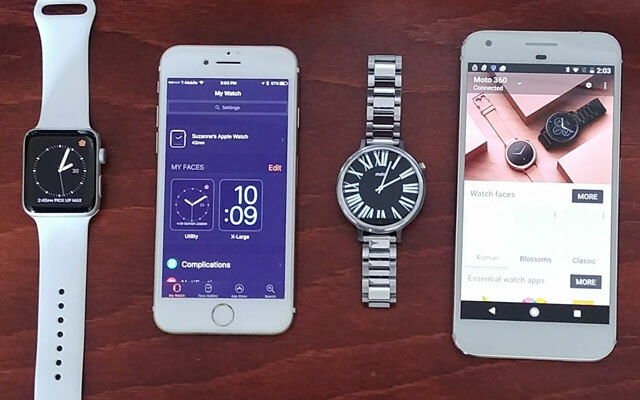 Android watches work with iPhone and Android smartphones. Use a growing selection of available apps, and you can download customizable watch faces. But when it comes to style, smartphone app integration and fitness features such as water-resistance and GPS, the Apple Watch Series 2 just edges Androids. For now, the Apple Watch works only with iPhones. Verdict: iOS takes it. If you have or want the currently superior Apple Watch, you need an iPhone. Watch out: Do you really need a smartwatch? Researchers at Gartner found that nearly a third of all smartwatches get abandoned by users, who found them boring or less useful than expected. On the other hand, Apple controls both the iOS software and the hardware of the devices that use it. Updates are already tested to work on iPhones and iPads. There are a couple of exceptions to the Android update process. 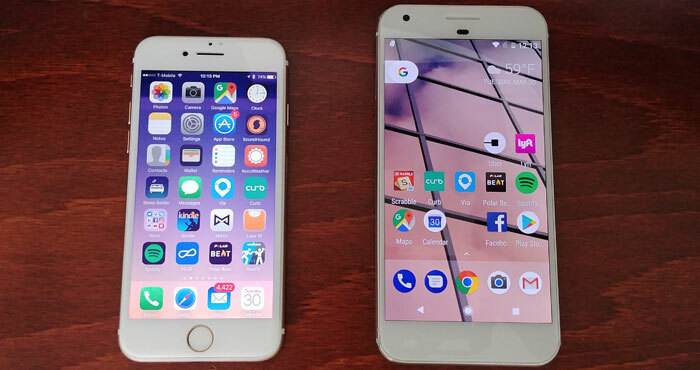 Google’s recently launched Pixel and Pixel XL phones are created fully in-house, like Apple’s, and receive updates as soon as they’re available. Verdict: iOS guarantees you’ll get updates as soon as they launch, though users of flagship Android devices such as the Samsung Galaxy S8 often don’t wait long, either. Watch out: Software updates are a vital part of smartphone hygiene, but they haven’t been without their issues. 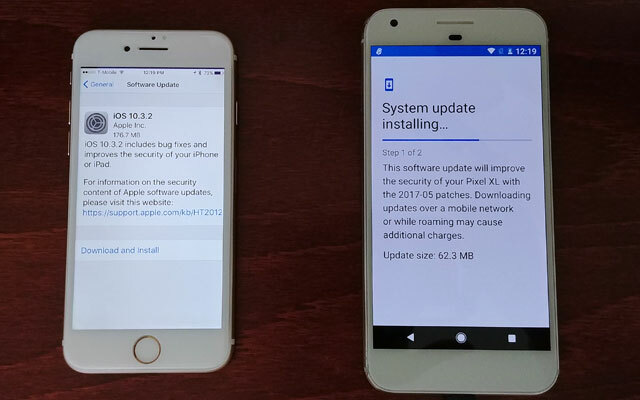 Both iOS and Android updates have been known to brick phones or freeze performance. Keep your phone backed up at all times. Flagship smartphones like the iPhone 7 or Galaxy S7 come at a few different price points according to storage capacity. It’s always worth considering how much storage you’ll really need before maxing out your budget on the smartphone with ostensibly the best specs. For example, the lowest-storage model of the cheapest iPhone, the iPhone SE, clocks in with an RRP of $399. But at 16GB and just 5GB of iCloud storage, unless you have a rigorous backup-and-delete photo plan, chances are you’d need a pricier model with more storage for at least $100 more. On the flip side, Android budget phones from the likes of Samsung, Huawei and Motorola range from $100 to $375, and you can usually expand storage via an added microSD card costing about $20. Verdict: If price is a concern, Android offers a huge range of high-quality phones for less money. Watch out: Cheaper phones from lesser-known manufacturers could suffer from security issues, so choose phones from manufacturers with a strong U.S. presence to ensure software fixes get quickly rolled out. You’ll never be able to convince us iOSers that Android is anything other than a loaded Chevy compared to our Cadillac iPhones! That’s what they taught us at cult school anyway! 1) I did not want to pay a lot more for storage, so Android phones can take memory cards that are much cheaper than iPhone storage. 2) spare batteries. iPhones don’t do spare batteries. confront your cheating spouse with evidence, I was able to spy on my cheating ex phone without finding out…..it really helped me during my divorce ...you can contact h a c k s e c r e t e @ g m a i l. com call for spying and hacking social networks, school servers, icloud and much more,viber chats hack, Facebook messages and yahoo messenger,calls log and spy call recording, monitoring SMS text messages remotely,cell phone GPS location tracking, spy on Whatsapp Messages,his services are cheap.. and please tell him i referred you to him he is a man with a heart of GOLD. I have a Samsung S6 and I have the Nougat OS which is the top OS for Google. And I get a monthly security update. In September I am going to go with an S8. I love android and have had no major problems, but for a very occasional hiccup. Have you gotten your galaxy s8 yet? if so, how much was it do you know? I currently have a zte android for my phone. I’m very satisfied with my android. There are certain things that the android can do that are amazing. For example, there are other places where you can get apps, not just from the google play store. The google play store has many free apps, but you can download apps from anywhere on the internet. If you don’t like the standard keyboard, then you can download another keyboard. I personally like using the Swype keyboard because it lets me type what I want to really fast on my phone, instead of wasting time trying to tap one letter at a time with my finger. Another thing that I find useful are sd cards. This provides more memory to store extra stuff. The sd card lets you store more content and it acts as a safe storage for it. If your phone’s memory gets deleted, all of your stuff in the sd card is safe. iPhones, however, can’t have more storage because they don’t even have slots for sd cards. Another thing that I enjoy about my android is that it’s durable. I have dropped my phone so many times and it isn’t very beat up, considering I haven’t bought a case for it. Also, I knew that my phone had to be not too expensive because I was on a budget. Androids are perfect for teenagers that have parents that want to buy them inexpensive phones and they don’t have that much money themselves. Teens like myself should choose android to buy an affordable phone for their own budget because androids come in a wide range of prices. iPhones, however, can cost a lot. I prefer Android because of the customization it has to offer. I prefer to be able to change change almost every aspect about my phone and making it the way I like it, not the way Apple likes it.